One-on-one home piano lessons for students of all ages and levels. Whether your child is a complete beginner, or have a few years of experience, our teachers are there to guide them & watch them grow into skilled pianists. If you are ever not happy with any part of your piano lesson, we will fully refund your money, no questions asked. Whether you’re a complete beginner, or have a few years of experience up your sleeve, our teachers are there to guide you and watch you grow into the pianist you always wished you could be. We are passionate about music and are passionate about helping our students achieve what they’ve set out to do: play the piano themselves. No matter whether you wish to just learn a few pieces or wish to grow into a concert pianist, we are here to guide you on your musical journey. Do I need to travel anywhere for my lessons? At Piano Lessons In Your Home, our teachers come to your home, meaning you don’t have to fight traffic to get to after school lessons. What areas do you service? On which days of the week? Currently, lessons from a Monday to Thursday are taught around Sydney CBD, Inner West, North Sydney and the Eastern Suburbs. However, lessons in the North West are available on Friday evenings. Please enquire for more information and for information on weekend lessons. We know pianos may be out of some people’s price ranges, but keyboards are perfectly fine for beginners. Introductory keyboards are an easy and affordable option for homes without a piano. When do you offer piano lessons? We typically offer after school lessons, on weekday afternoons to evenings, our teachers are flexible and can usually accommodate to the time that suits you best. Weekend lessons are available, please enquire for more information. 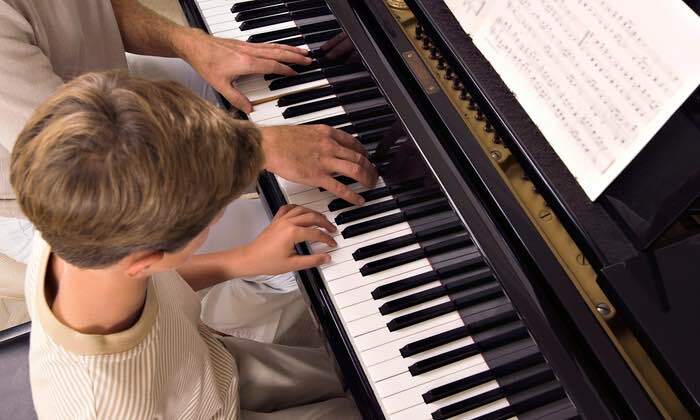 Children as young as five can begin learning the piano and basic music theory. Our teachers are experienced in tutoring young children who are complete beginners, and have all the patience and personality needed to engage your child and give them best start in their musical journey. Our teachers are qualified to teach all styles of music, whether you’re interested in popular, contemporary, classical, jazz, musical theatre or even Nintendocore (yes, this is an actual genre). However, we encourage our students to explore all genres to show them just how interesting the piano can be. Why enrol my child in one-on-one lessons? Why not group lessons? Group lessons are a great way for your child to socialise, but that’s about were the perks end. Individual lessons ensure that your child won’t get left behind, and can learn at their own pace. In personal experience, students learning in individual lessons progress a lot faster than students learning in group lessons. Am I too old to start playing the piano? Absolutely not! There is no right age to begin learning a musical instrument, and the best time to start is now! We can teach you your favourite songs, how to read music, theory, or just about anything you’d like to learn about the piano. The piano is a fun and great way to exercise your creative abilities so don’t just dream about it, start learning. What are your teachers qualifications? Only the best piano teachers work with our students. Our teachers are highly experienced in teaching students of all ages and skill levels, are experienced in the piano themselves, have undergone a NSW Government certified “Working with children” police check, and are very friendly and patient with children to make students comfortable with learning at their own pace. Kayla teaches all four of our children piano lessons weekly and has done so for more than a year. She is great with the kids (ages 8 to 14). She is not only talented and knowledgeable about music, but also has passionate about the art form.